I’m a big fan of the Doctor going back to the early eighties at which time I became hooked and consequently found and watched almost all episodes. I don’t want to go over ground people know already so I’ll keep the background on DR WHO brief. The show has been running since the early sixties and was brought back in full blown high production a few years back. The Doctor is a traveling time lord who moves through out space and time in the TARDIS (Time and relative dimensions in space), a machine bigger inside than out that is stuck in a mode to make it look like a police box. The good Doctor travels the universe saving people and planets and has a number of recurring villains. This set has a total of fourteen episodes which includes the 2007 Christmas Special. The Special is called Voyage of the Damned as sets the Doctor on the Titanic, a space ship named after the famous ocean liner. Based on its name sake you can imagine things are going to go wrong, and they do. The Doctor is a stow away and befriends a waitress named Astrid played by Kylie Minogue. Horrible things happen, the ship is in trouble and the Doctor saves the day. And for the first time in a few years London has a Christmas without a disaster. Great episode and a wonderful transition between seasons. This show endures because of the fans love of the characters. This is personified by a nice little extra on disc one in which this doctor meets the doctor played by Peter Davidson. David Tennant actually says to him, you were always MY Doctor. I agree. But of course I like them all, and David Tennant is so wonderful in this role. Fans of the show will love every minute and new comers, well this is as good a jumping on point as any other. I loved this show with its cheesy low budget effects, I love it even more now that it’s a high production outing every episode. The writing is intelligent and offers little nods to old time fans and thrills the new comers. Possibly my favorite season(series) of one of my all time favorite shows. 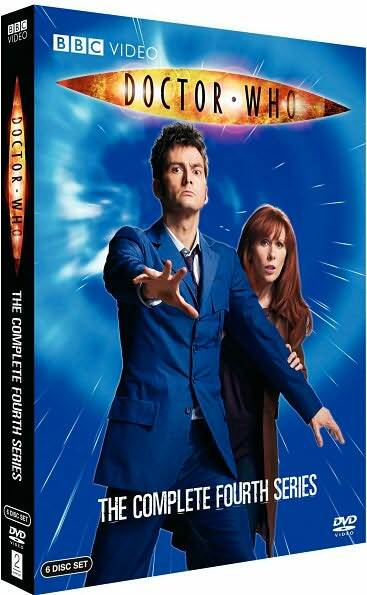 Order Doctor Who: The complete fourth series from Amazon.